Just recently, new measures were enacted into the Parliament, mainly to address the issue with gender inequalities in Australian workplaces. The Australian Government introduced newly modified legislation to Parliament. This legislation depicted the intention of improving and subsequently continuing the Equal Opportunity for Women in the Workplace Act, in addition to the Equal Opportunity for Women in the Workplace Agency. The move was successful, as the amendment bill for the aforementioned Acts passed on November 22nd of this year. The amended Act is now referred to as the Workplace Gender Equality Act. To correspond with the aforementioned, the Equal Opportunity for Women in the Workplace Agency is now the Workplace Gender Equality Agency. The main objectives of both Acts will help combat gender inequalities and improve gender related workplace diversity. This comes in the form of promoting and improving workplace and employment related gender equality, in addition to supporting employers to remove barriers preventing women from fully participating in the workplace. 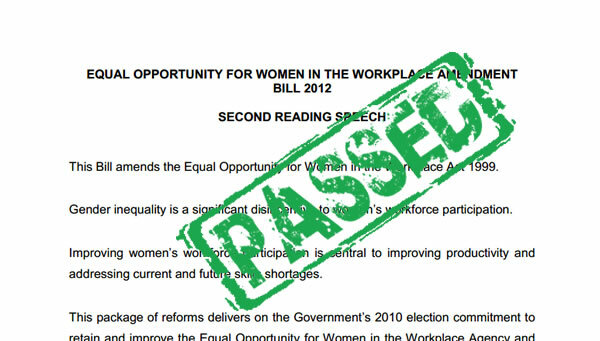 In other words, the newly amended Workplace Gender Equality Act is designed to bring light to the issues Australian women face at work. As a woman in today’s workforce, the WGEA will expose and help correct the barriers preventing you from seeking work. Workplace inequalities have always been present within in the Australian workforce. Several studies, with substantial evidence, have proved these inequalities over the years. In fact, women have been under-represented in higher earning positions and industries. It has created a 17.5 percent gap as a pay discrepancy between the salaries of men and women. Many attribute the discrepancy to ingrained cultural stereotyping and expectations, however the issue is so important that trivial matters like the aforementioned shouldn’t be used as a scapegoat. A significant change with the new Act helps women better combat workplace discrimination in Australia. Employers have always been required to report data relating to the gender composition of their workforces. The WGEA now requires employers to submit more details information to the Agency. Most of the information is available to view online, allowing analysis and evaluation of their results by the public and other sources. Employers will have to disclose information to both employees and shareholders regarding their gender composition data. This newly implemented system will allow employers to keep track of the gender discrepancies found in their workforce. Through the implementation of this act, the security of the Australian workforce is expected to continue prospering through the advancement of gender quality in the workplace.